We discussed in our Generating More Sales on Shopify Stores article the importance of pricing on conversion rates. The first thing to remember is that we are in the age of comparison shopping. It takes now less than 3 seconds to see the product you think you want, and to compare that price across thousands of people selling EXACTLY the same thing. So what do you do? How do I figure out how to price my product, or what price should I charge for other people’s products that I am selling. Well, simply put, this is the question that has plagued sellers for ever. Is an apple worth $0.50 or $1.00, what price should we charge for gas vs the guy down the street? The answer is never an easy calculation, but one that can make your business succeed or fail. The first is determining what the profit / profit margin that you wish to accomplish. But wait… Cost of Goods Sold? What is that? This is where I see people miss the mark regularly. 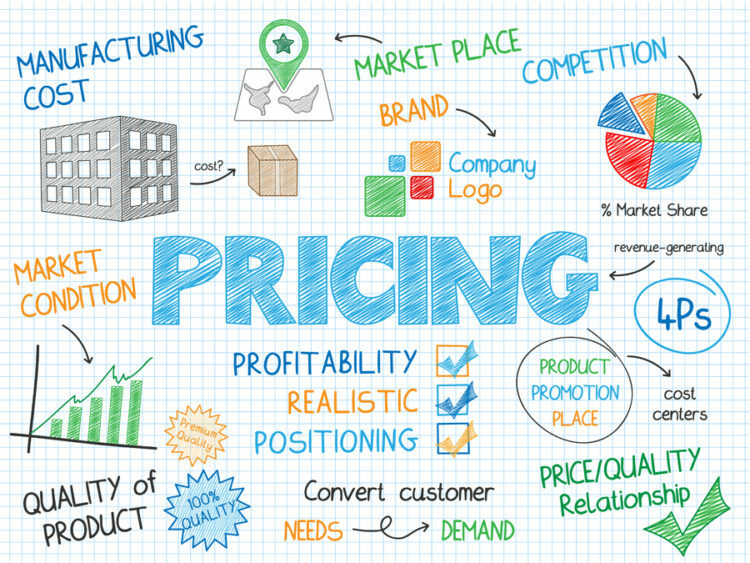 The cost of goods sold is defined as “the direct costs attributable to the production of the goods sold in a company. This amount includes the cost of the materials used in creating the good along with the direct labor costs used to produce the good. It excludes indirect expenses such as distribution costs and sales force costs.” With that definition in mind… what if you aren’t creating the product. What if you are selling a product someone else has made… what then? No… i am not a financial advisor or accountant. I am not even really that great at running my own books. However, I have been in business a while and seen every struggle someone could face. The biggest is “Real Profit” or as my accountant says “Net Profit”. The net profit is essentially the Revenue – All Possible Expenses. This number is much more valuable per product than people consider usually. That table is showing just what the initial numbers are directly from Amazon. You need to include your time at some value, cost of internet at your home, income taxes and a whole lot more. What about the drop shipper? If you are using a service like Oberlo etc these numbers become a bit more simple. You select a product, they charge you a COGS essentially, and you charge shipping etc to your customers. But that doesn’t mean you don’t have work to do. I have seen quite a few drop shippers that assume they want a 40% profit margin, and simply add that to the top. Easy right? Well what happens when the guy next to you figures out that they just want to sell a ton more products at a 5% margin? Easy… customers buy from them because it is the lowest price for the same thing. This means that for every product you bring into your store for a drop shipper you have a lot of work to do. Not only do you need to edit images, adjust titles, change descriptions (all for SEO reasons); but you also have to check prices. Search Google for the same product name, a sku number, etc and see what the prices are. You don’t have to be the lowest if your site good but you will never succeed as the highest in my experience. So why even do it? Yes, these numbers seem like a whole lot of work, and often seem to beg the question why even try to do this in the first place. The answer is simple. You don’t want to work for the man! If you are like me you don’t want a boss, you don’t want the schedule that keeps you from your kids. You want to be the master of your own ship. The struggle is real. You have to work to be successful. Long nights, early mornings, holidays and weekends. But if you put the effort in, you will be rewarded!